Being a kid never really ends. I remember being five years old, taking my stickers, and literally posting them anywhere that would have them. 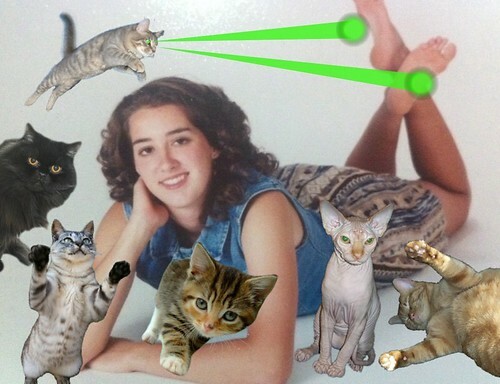 But since when has it become acceptable for grown adults to want to paste cats with laser beams shooting out of their eyes onto normal family photos? Since CatPaint. This app does exactly that. It brings the youthful love of random sticker placing and the internet cat craze together in a mesh that will make you think, “What am I doing?” and then continue on with your marvelous creation. You are apparently never too old to want to take a selfie next to a rainbow-colored unicorn. Known for her fun and colorful images that inspired a generation of makeup, backpacks, and stickers that can still be found stuck under the desk of a third grade classroom, this app allows you to take a photo and paste in any of your favorite Lisa Frank characters. You now have to opportunity to stick that overly excited overall-wearing bear anywhere you would like to in the snapshot of your living room or that unforgiving photo of yourself. The newly belovèd Candy Crush. With it's technicolor display and "match three" tactics, some might compare it to Bejeweled. But this game includes a simple but fun child-esque storyline which follows the main character Tiffi, a blonde girl with pigtails, through a candy land of (currently) 410 levels. You start off with five lives and gain a life every half hour so if you get as addicted as the majority of it's players do, and can sit there playing for hours on end, you run out of lives fairly quickly. All this does is leave you with the familiar childish feeling of always wanting more. Another game that I clearly remember playing until the sun came up, The Sims. The ability to play god is just as entertaining as when we were juveniles and apparently, it will never stop. Why live your life when you can sit around and live through a virtual one? No taking out the garbage. No piles of laundry to do. When you’re in your youth, you ponder one day having a family of your own and actual responsibilities. Now that you have all that and know what it entails, as escape can be necessary. Now that it’s available on a mobile device you never have to live in the now and just live in The Sims. 5. Classics: PAC-MAN, Monopoly, Galaga, etc. Games like these literally bring it’s players (especially the older crowd) back to when they were young and wandered to the nearby arcade to spend their quarters on endless rounds of these classic games. Now that they’ve moved to the app world, everyone is able to enjoy these games all over again but in a different contemporary fashion without fumbling around for change.